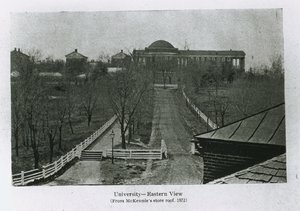 By 1850, the Academical Village could no longer provide space for all of the University’s needs; the Board of Visitors hired Robert Mills to design a multi-purpose academic building. Mills had studied Jefferson’s architecture books before embarking on a significant career that included designs for the U.S. Treasury and the Washington Monument in the nation’s capital. Connected to the north side of the Rotunda and raised on a podium, the “Annex” was inspired by Jefferson, although the column capitals were made of the modern material cast-iron. Many later found the building too large and criticized it for overwhelming Jefferson’s Rotunda. More than double the size of Jefferson’s Rotunda, the Annex boasted a number of classrooms and a lecture hall, replacing the Rotunda dome room for large gatherings. 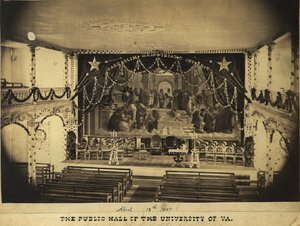 Between 1850 and 1854, University alumni commissioned a copy of Raphael’s “School of Athens” by the celebrated French artist Paul Balze for the new building’s 1,200-seat auditorium. The hundreds who contributed envisioned the painting as a “nucleus of a Gallery of Fine Arts” that would, like the Academical Village, be inspired by ancient Roman buildings and provide American students with the opportunity to experience the masterpieces of Europe.